As managers like you, we know that technology is essential to your business. And it's not surprising that this amazing technology comes at a price. Objectics has developed a cost reduction and efficiency enhancement service in the form of employee empowerment videos. Customized to your company, these videos provide multiple, bite-sized portions of the knowledge your employees need to be successful and to efficiently meld into your company—learning how to do your business the way you intend, from the very beginning. The Objectics team merges our long history in business with our tremendous training experience to capture the essential elements of how your business uses its software. We then create the videos that your current, new or job-sharing employees can use to quickly and correctly come up to speed. 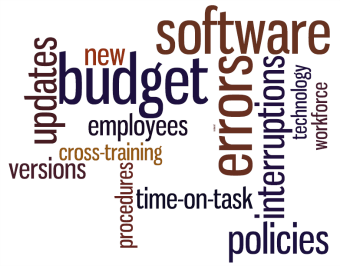 Reduce time and money when introducing new versions of software to employees. 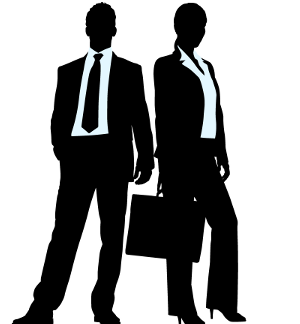 One of the advantages of the Objectics video solution is that you pay once for a set of videos, but your employees (current and future) can review them over and over—anywhere your company does business, on any computer that you allow, as much as your employees need, and wherever they are. In effectiveness: Employees do not have to be mass-trained on every topic, all at one place, and only at one time. In the anti-frustration factor: Learning is accomplished "just-in-time" and only on topics of immediate importance. In time-on-task: Knowledge transfer happens in small, discrete chunks that are naturally consumed in a "watch and do" process. And one of the major advantages is that these short and to-the-point videos allows your employees to review the exact topic that pertains to their immediate needs. Our team can also embed interactivity in the videos to check for understanding. Create consistent, clear messaging with Objectics' onboarding video solutions. Let our team work with you to develop an orientation program designed to acquaint your new or transferring employees to your business culture; your software applications; and your best practices, policies and procedures. Contact an Objectics consultant to review how we can help you to translate your current onboarding process into a consistent, reviewable, time-saving video library. 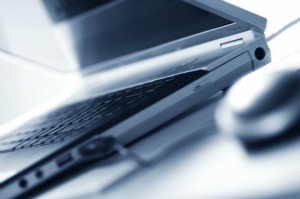 Share knowledge and process with your external audience via versatile digital screencasts. The online delivery format allows you to share Objectics' powerful training video solutions with your vendors or customers anytime, anywhere, on nearly any device. The Objectics team will work with you and your support team to create compelling, informative videos to guide your customers and partners through your business process. 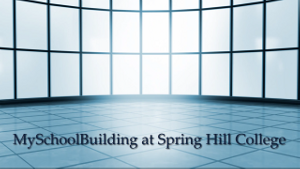 Specializing in SAP Business Objects® systems support, our technical training consultants provide an excellent classroom experience for both novice and seasoned users. Choose from our proven curriculum using our sample data, or work with one of our training consultants to tailor your training sessions by incorporating your company data and business processes. Objectics provides a training curriculum that covers all current versions of the Microsoft Office® suite, Adobe Acrobat Professional®, and other popular business software programs. Whether your training needs include exploring Excel® functionalities (such as pivot tables, charts, conditional formatting, formulas, or data analysis); using mail merges and field codes effectively in Word®; preparing effective PowerPoint® presentation for the business environment; or working efficiently between all three applications, our trainers are skilled in preparing examples and presenting information so that all participants are able to meet their knowledge acquisition needs. Interested in customizing training sessions for your employees? Our training consultants will work with you to design the perfect mix of business applications coursework to maximize your in-class experience. 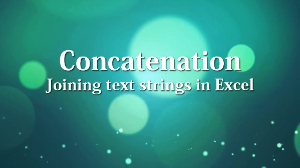 (5:05) Are you looking for a fast way to combine text, numbers or field information? 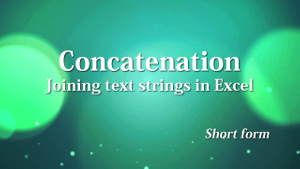 Try Excel's Concatenation function.